At the beginning of November, the Union Hotels announced the renovation of one of their hotels in the center of Ljubljana – the Central Hotel. The hotel is a well-known conference hotel in Ljubljana. It offered contemporary premises for various types of events. Before the official closure of the hotel, the management of Union Hotels d.d. decided to organize a charity campaign for the sale of hotel room inventory at symbolic prices. The entire proceeds of the campaign were dedicated to charity organizations. Nowadays, hotel renovation is not only replacing worn out furniture and mattresses. A renovation is the definition of competition in the hotel industry. For a hotel to be competitive it needs to be up to standard, technologically aligned and design wise fresh. 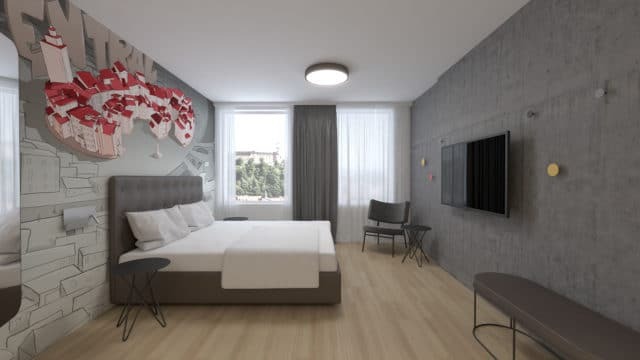 April 2019 will bring renovated hotel premises, that will for sure raise the quality of staying for its guests and pin the hotel on the top of the competition list. The Central Hotel is a smaller four-star business hotel, which offers excellent location and full comfort. The hotel is close to the main bus and railway stations. And the location of the hotel is perfect to explore the sights of Ljubljana and the old city center, which is accessible on foot. The hotel has 71 comfortable rooms and 3 suites. If you travel by car you can use the parking garage in close vicinity of the hotel.